So you’re looking to protect your personal data from any potential breaches? Maybe you’re afraid your personal data may fall into the hands of cybercriminals? While that is true, cybercriminals aren’t the only people you have to worry about when it comes to protecting your data, government surveillance, ISPs, and internet advertisers are also looking to get a hold of your private data for surveillance or financial purposes. Even if you believe you have nothing to hide, you deserve to have the right to privacy and the right to do whatever you want to protect your personal data, because, by the end of the day, it is ‘your‘ personal data. 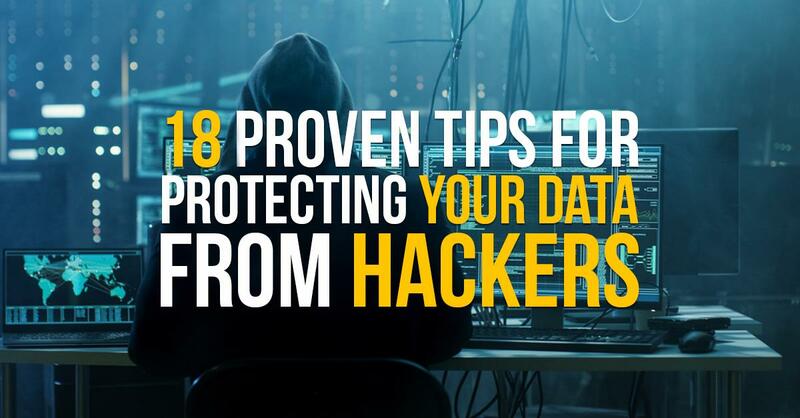 We have put together 25 useful and practical data protection tips to help you protect your personal data from cyber criminals or anyone trying to steal your data. First things first, before you worry about anyone trying to steal your data, you first have to make sure that your data is safely backed up in case of a computer damage, stolen data, or any other unfortunate incidents. Backing up your data into a dedicated external hard drive with fire and water proof features is a great way to have a good night sleep free of worry from any potential data loss or damage. Malware (or malicious software) attacks are everywhere online in websites, emails, and computer files, it’s a real threat to your personal data. Trojan, ransomware, spyware, and other types of malware attacks are a favorite choice for cybercriminals. This is why you need to use a reliable anti-malware protection such as Malwarebytes software to protect your data. Cloud storage simply means storing your data on the internet, because while external hard drives can be pretty secure, storing your data online can be more convenient too, since you can access your data using multiple devices, and you also don’t have to worry about losing your hard drive. However, you should make sure to choose your cloud storage provider very carefully, as it’s best to choose a provider with offsite storage solutions so that your data isn’t online 24/7 — because that’s not very safe. Most people hate waiting for operating system updates when they’re about to turn off their computer, especially Windows users, and while it can be very frustrating, it is definitely recommended to install system updates whenever they are available. Because if you don’t, you run the risk of having your computer and data compromised by hackers who may have discovered security vulnerabilities in old operating systems. So always make sure to update your computer’s operating system to keep your data protected. Everyone loves public Wi-Fi, it’s mostly free, available in many places, and it’s convenient to use while you’re on the go, while that is great, it is also very risky. Hackers also love public Wi-Fi since they can easily collect and steal your data with a simple software, this is mainly because most public Wi-Fi networks out there are insecure and in most cases, they don’t use any encryption standards to protect users. Fortunately, you can use a secure VPN software to secure and encrypt your data while connecting to public Wi-Fi networks. Did you think a VPN is only good for securing public Wi-Fi? Think again, a virtual private network is a must-have tool for protecting your personal data while browsing the web. A VPN software allows you to access a private network and hide/change your IP address to any country in the world, which can help keep your data protected from hackers, your ISP, and internet advertisers, as well as government surveillance agencies. A VPN’s advantages are just too many to list here, heck, even cybercriminals themselves use VPN software to help keep their identities anonymous, so you may as well use one of their secret weapons to protect your data. RELATED: Why a VPN? Here are 10 Reasons Why. If you can remember your password while you’re reading this, then odds are your password isn’t as secure as you think it is. You probably need a better one, your new password should be a little bit longer and should have a combination of letters (lower case & upper case), numbers, and special characters, this will make it a lot more difficult for hackers to crack your password. While it’s difficult to delete your current go-to mobile messaging apps such as WhatsApp or Messenger, it’s best to consider a new option if you’re looking for secure encrypted communications. Signal is a mobile app endorsed by privacy advocate Edward Snowden, it uses end-to-end encryption which means it is mathematically impossible for anyone to spy on your ongoing communications. It is also open-source which means it’s been tested and verified by privacy and cybersecurity experts to be a great option for everyone looking to communicate securely and keep their data protected. Common cybercriminals use brute-force to steal your data, clever cybercriminals scam you into giving out your private data. Chances are you have probably heard of people who have given up their personal and financial information to people disguised as legitimate authorities over the phone. If you don’t want to fall victim to these scams, make sure to never give out sensitive information to anyone over the phone or in your email inbox. It’s just too risky, scammy telemarketers and email spammers are everywhere. We all know that no matter how expensive your smartphone is, it could one day end up lost or stolen with your valuable data in it. It’s everyone’s worst nightmare. While some modern smartphones nowadays have data recovery features in case your phone gets lost, you should have the option of wiping your data from it remotely, or you should at least set a strong password or authentication process so that no one gets access to your data when your phone is lost. Nowadays, it’s getting ridiculously easier for cybercriminals to hack online accounts since most don’t even have a strong enough password. Two-factor authentication (or 2FA) is an extra layer of security used to verify login attempts and prove account identity with a time-sensitive code, which makes it a lot more difficult for hackers to access your accounts. You can quickly get started with this service, Google has a 2FA app which is easy to set up on your smartphone device. When you visit a website or a social network for the first time, there will be a tracking cookie installed on your browser or computer that will give you the option of auto-login into that site automatically next time you visit it without having to enter your email and password again, similar to what you’re probably doing with Facebook, Twitter, and Snapchat. And while this can be pretty convenient, it is an unsafe practice, if that website gets hacked, your personal data will also be compromised. Logging out from websites and apps each while you’re not using them will help keep your accounts secure and protected from any potential data breaches. If setting up a strong password will make it hard for you to remember it, you can use a password manager like LastPass to make things a little more convenient without compromising the security of your data. LastPass is a popular password managing software that saves all your online accounts’ passwords into the software, you only have to remember one master password to login to the rest automatically. According to LastPass, 81% of data breaches are caused by passwords. Having to remember one master password while using a password managing software like LastPass with strong encryptions technology will help protect your accounts and data from hackers. Cybercriminals are always looking for new ways to hack electronic devices, recently there have been reports of hackers exploiting Bluetooth connectivity to compromise mobile devices. According to Techcrunch, there have been incidents of mobile devices infected with malware due to a security vulnerability in Bluetooth connectivity. Turning off your Bluetooth connection immediately after use will help protect you from hackers and data breaches. I will assume you probably already know what that green lock on the top left side of your browser screen means. Even though HTTPS security protocols have become almost a standard in today’s world, there are many websites out there that still use the old insecure HTTP protocol. Luckily, HTTPS Everywhere is a browser extension developed by the famous Tor Project that allows you to automatically connect to the secure HTTPS version of almost every site, even when they don’t have an HTTPS connection. This will help keep your data protected and encrypted when you use those sites. Have you ever heard of the saying, ”there’s an app for that?”, this probably describes the growing number of mobile apps entering the mobile app market on a daily basis. Problem is not all of them are legit, and many of them are actually scam apps developed by malicious developers and cybercriminals as an attempt to collect and steal your data. It’s best to not install unnecessary apps if you want to keep your data protected. Chances are your computer or mobile device’s storage is full of old files and documents, and you probably don’t want to delete all these old files or maybe you don’t even have the time for that. But what if someone hacked your device? would you want them to find all those old sensitive files and information? Probably not, right? Getting rid of your old data will not only help with improving the performance of your electronic devices, but it will also help minimize your risks in case of a data breach or a hacking incident. If you’re looking to dispose of that old electronic device, you should first make sure it’s not working anymore. Anyone with the technical know-how can easily recover your old electronic device and find your data. So it’s best to make sure your old electronic device is no longer working when you’re looking to throw it away, you never want your sensitive data to fall into the wrong hands.